For this review I’m going to talk about the 2nd generation Focusrite Scarlett 2i2. I use it mostly for guitar and bass recording so that’s the angle this review will cover. The 1st gen 2i2 model has become one of the most popular USB audio interfaces for under $150; in fact Focusrite claims that it’s the best selling USB audio interface in the world. The 2nd gen model improves on it in a number of ways and fixes the main shortcomings by lowering latency and adding more headroom for hot guitar pickups. I’ve been using a 1st gen Focusrite Scarlett 2i4 for the past 5 months. It has turned out to be very reliable and it works great but the only thing I don’t like is the latency. I wanted to try out the 2nd gen 2i2 since Focusrite managed to lower the overall latency considerably. As the name implies, the 2i2 has two inputs and two outputs. The inputs are combo jacks that can accept both XLR microphone cables and 1/4″ instrument cables. With two inputs you can record two mics or two instruments at the same time, or one mic and one instrument. The 2i2 doesn’t have any MIDI or SPDIF inputs/outputs; it’s a basic interface with 2 balanced outputs for connecting 1/4″ TRS cables to speakers. The 2i2 also has a 1/4″ headphone jack on the front with its own separate volume dial. Both inputs have the option to switch between line and instrument. To get the best sound with DI (direct input) guitars you need to set it to instrument and line for mics. If you have a separate DI box in front or something else with a Hi-Z input you set it to line. One of the main upgrades with the 2nd gen 2i2 is the 8dB increased headroom added to the instrument inputs for hot pickups. This remedies the clipping problems of the 1st gen 2i2 and Solo models. I have a guitar with active Seymour Duncan Blackouts and it indeed works well without clipping. Other hardware upgrades with the 2nd gen models includes added surge protection circuits to the inputs and outputs, and updated converters that support up to 192 kHz sampling at 24-bit. The 2nd gen models also add darker indicator lines to the gain, monitor and headphone knobs—a minor change but I like how it makes it easier to see the levels. Like the 1st gen model, the 2i2 has LED lights around the gain knobs to indicate when the signal in clipping and when it’s in the green (it also shows orange just before clipping). There’s also a 48V phantom power switch for mics that need power and a direct monitor switch for monitoring without latency. Overall the Scarlett 2i2 has nice hardware, the knobs and connectors don’t feel cheap, and the red aluminum casing is rock solid. Detailed tech specs for the Scarlett 2i2 can be found on the Focusrite website. The biggest change with the 2nd gen Scarlett interfaces is lower latency and increased sample rates. I already posted the latency comparison numbers for Windows so I won’t rehash them again here, but I will give a usage example. I often use a setting of 48 kHz and 64 samples for recording DI guitars. At that setting on the 1st gen 2i4 it has 12.4 ms of latency—and that’s the lowest it will go at 48 kHz. At 96 kHz it can get down to 9.5 ms but it’s like double the CPU hit. On the 2nd gen 2i2 at the same 48kHz/64 setting it has 7.79 ms of latency, so that’s a pretty big improvement. Plus with the added support of higher rates you can drop it down to a setting of 48kHz/32 to get 5.17 ms of latency, almost half that of the highest setting on the first gen model. You can even get it down lower around 3 ms at 96 kHz and up. Focusrite claims it can get down to 2.74ms at 96kHz/32 samples on a Mac Pro. Lower latency also helps out with overall CPU usage because you can use higher buffer settings without having to sacrifice as much latency like on the 1st gen models. I always had to use the lowest buffer setting on the 1st gen 2i4 because there was way too much latency at higher settings. All I can do is compare the Scarlett 2i2 with the other audio interfaces that I have. To my ears, recording DI guitar sounds exactly the same between the 1st gen 2i4 and 2nd gen 2i2. The Focusrite interfaces sound better than the Avid Fast Track Solo that I first started recording with, and the iRig UA that I just got last week for the free Amplitube 4 deluxe deal. The 2i2 has a clearer more natural sound when it comes to guitars. You can hear higher frequencies better and it has a brighter overall tone than the Fast Track Solo, which has since been discontinued so no loss there. The Fast Track sounds more like having the tone knob on the guitar turned down by comparison. Windows systems require installing drivers before you can use a Scarlett USB interface. The 2nd gen models use different drivers than the 1st gen models. The 1st gen drivers have been really stable on the 2i4 so I was hoping for the same with the 2i2. At first I had a number of problems with the 2nd gen drivers, as noted in a couple of earlier comments, but then Focusrite updated them and now things are running smoothly for the most part. Even running the CPU up to 90% audio playback is clear and glitch-free. However, I have encountered a couple of bugs with the new drivers. First, whenever I try to use screen capture with Ableton Live (for video tutorials and reviews) it starts glitching out and the CPU meter jumps all over the place (that’s why the 2nd part of the video review below gets a bit disjointed—I intended to show more examples and explain things better but the drivers weren’t allowing it). After some further testing, screen capture causes Pro Tools 12 to go haywire as well so it must be a specific issue related to CamStudio, which works flawlessly with the 1st gen 2i4. The second problem, a couple of times it froze my computer when the monitor went to sleep while music was playing. I know it had something to do with the 2i2’s drivers because the interface was disabled upon restart and the sample rate was changed and had to be adjusted to get it working again. I’ve also had to toggle the sample rate on a couple of occasions to get rid of audio glitches. The drivers on the 1st gen 2i4 did not have these issues. Just be aware that drivers may not work perfectly on your system—that’s the nature of having to deal with Windows drivers. It may not even have anything to do with the interface. When I first started recording, the crummy driver for my wireless card caused all kinds of problems until I tracked down a newer version from the OEM. The Focusrite Scarlett models come with one of the better software bundles that you’re going to find with an audio interface. The 2nd gen 2i2 comes with Ableton Live Lite 9 and a Pro Tools pack that adds some cool pedal effects and a couple of amps to the free version of Pro Tools. Both DAWs offer a ton of features even with the slimmed-down versions. Ableton Live Lite is a lot better than most people give it credit for; I use it every day even with full Pro Tools 12 on hand. Plus you can use both together with ReWire—that’s a good way to take advantage of Live’s drum racks and other included effects and tools within Pro Tools. 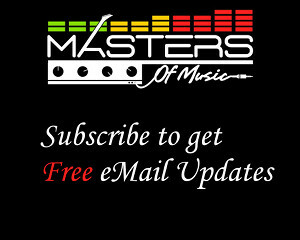 Some plugins are included with the software package as well, including Softube’s Time and Tone bundle, the Focusrite Red Plug-Ins, and Novation’s Bass Station virtual synthesizer with 2GB of Loopmasters samples. The 2nd gen models advertise Pro Tools on the box but Pro Tools First is free to use anyway without the interface. What it comes with is a Focusrite Creative Pack that includes 12 free plugins to use with Pro Tools First (it’s unclear if you can use the plugins with the full version or not). The only downside with the free version of Pro Tools is that it only works with plugins from Avid’s marketplace (unless you pay for a workaround like Bidule or Reaper) so you can’t easily use the pedals with other guitar amp plugins. However, Live Lite supports third-party plugins and there are a bunch of good quality pedals and amp sim plugins that work with it, including a bunch of free gear that sounds quite good. There are six different models of Focusrite Scarlett interfaces. The Scarlett series are the USB models. They all have the same preamps and converters so the sound quality is the same between them. It just depends on how many inputs and outputs you need. The 6 different model include the entry-level Solo, the 2i2, 2i4, 6i6, 18i8 and 18i20. The first number in the model name indicates the number of inputs and the second is the number of outputs. The Solo is a lot like the 2i2 but it has RCA outputs instead of the balanced 1/4″ TRS connectors, and it doesn’t have the combo input jacks so it can only connect one mic and one instrument at a time. The headphone jack also has it’s own separate volume dial on the 2i2. See the 2nd Gen 2i2 vs 1st Gen 2i4 comparison review for more info about how the 1st and 2nd gen devices compare as well as the 2i2 and 2i4 specifically. Lower latency, as low as 3.06 ms on Windows, lower on Mac. Focusrite fixed the issue with hot pickups so there’s no more clipping. May encounter some bugs with the Windows drivers. No MIDI or S/PDIF inputs or outputs. No iPad support (Update: it does work with iOS now). Can’t set headphones to monitor separate output like on the 2i4 and higher up models. 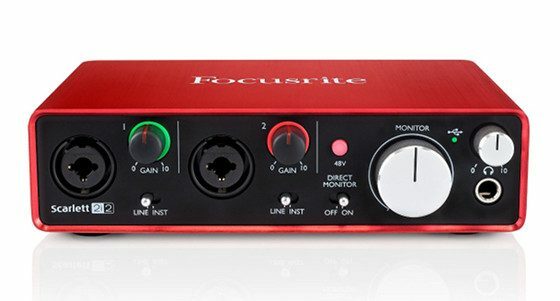 The solid build quality, clear sound, and low latency make the 2nd gen Focusrite 2i2 a good option for an inexpensive entry-level audio interface for recording guitars and vocals, especially for beginners. You may encounter some issues with Windows drivers like I did but that seems to be a pretty standard theme when it comes to audio interfaces and Windows. Usually toggling the buffer size fixes most issues so it’s not a big deal. The main downside with the 2i2 is the limited amount of inputs and outputs. Other similarly-priced brands like the Steinberg UR22MII and PreSonus AudioBox iTwo add MIDI in and outs and iPad support, but most MIDI devices support USB anyway so it’s not a big advantage unless you have a specific need for it. Update: It’s been exactly 2 months since I posted this review, and the 2nd gen 2i2 has been working great without any issues for the past month since the 4.11.0 driver update. I had to disable automatic screen timeout on my computer and switched to OBS Studio for screen capture and it has been smooth sailing ever since. I use the interface several hours every day between listening to music while working and playing guitar and I’ve really come to appreciate how well it has been working. The low latency makes a huge difference, and the CPU can be pushed hard without audio glitches. I’ve been able to get a lot recorded lately and several new songs laid out without the slightest problem. Consider me a fan. What about clipping? There was a lot of problems with it in Scarlett 2i2 1st gen. I’m particularly interested how is it going with recording guitar 🙂 Which 2nd gen Scarlett I should choose: 2i2 or 2i4 ? I’ve had no issues with clipping on the 2nd gen using active Seymour Duncan Blackouts as long as the gain knob is only turned up a little bit on the 2i2. On the 1st gen it would clip with the knob turned all the way down just barley plucking the open low string. The reasons to go with the 2i4 over the 2i2 is if you need the MIDI ins and outs, the RCA outs, or the independent headphone channel. Otherwise they’re basically the same. Since I no longer needed the PAD button on the 2i4 I just went with the cheaper 2i2. The PAD button removes 10 dB and the 2nd gen models have 8 dB more headroom so it isn’t as useful anymore. Hi I tried (2i2 2nd gen) with my acer laptop and desktop pc (windows 8.1). not recognize. What type of Computer you use? and what 2i2 shows when you connect it to your pc and successfuly recognize. Any led flickering? or pattern of led flickering? Did you install the driver before plugging it in? Yes I tried with older driver 4.8 version and new update driver 4.11 too. same problem. not recognize. sometimes shows “device descript error” in device manger usb controller. Are you use Branded pc? what is your system specification? My desktop PC is custom but the driver installed fine on my Toshiba laptop with Windows 10. I’d suggest contacting Focusrite support for that. Their email support is as slow as snail mail so I’d recommend trying one of the other options. I had a lot of hassle with drivers for windows 7. Took advantage of the free update to windows 10 that expires at the end of the month and solved this issue. Maybe you should try with the Asio4all drivers (had some troubles with my m-audio fastrack and the asio drivers, everything went fine when i used the asio4all ones, better stability, better latency). Wow, those M-Audio drivers must be really bad for Asio4all to be better. I have tried Asio4all and it was awful and unusable for recording DI guitars. These Focusrite Scarlett drivers are 10x better. They’ve updated them several times now and the latency and performance is very good. but i’ve never had any problem with the asio4all when i was recording DI guitars. Thanks for your review, the Scarlett looks interesting. I bought one the afternoon, but there’s something weird. When using the 4.15 focusrite asio usb drivers, the card won’t work (even worst, the system won’t load after rebooting). when using windows’s drivers, it seems to work fine. Sorry I don’t follow what you’re describing. You’d be better off contacting Focusrite support for help. I’ve had so many headaches trying to install the win 7 driver on my computer (HP elitebook i5 8gb ram and win 7 64, ASIO4all is a disaster on my laptop, this driver may work for some people but it’s been a disaster for me: “Device not Ready”, USBmatrix un supported, It will not take the SP1 update, Digital signature not authorized, etc… ..I’m pulling my hair out, and here in Mexico we can’t return it! I have the 2nd gen, and im not good with digital equipment. But, at what gain level should it be set? Im using passive pickups. Like around 10 or 11 it stops clipping, but sounds muddy! At 9 sounds ok. But if you strum hard it clips. So around 8 o’clock no clipping and no muddy tone. But i lose tone! Any tips? Now imagine a guitar with active pickups. Hi there, is it compatible with Linux operating system? If not, what windows version should I use? I don’t know about Linux support—you’d have to ask Focusrite support—but it works well with Windows 7 and 10. The links usually stay active for awhile after they post new ones. Just copy the url for the current download and change the numbers at the end to the version you want.